Randomization to PSA screening was not associated with reduced risk of prostate cancer mortality in large trial populations, researchers found. Men aged 50 years and older should discuss the benefits vs harms of prostate-specific antigen (PSA) testing with their physicians, according to new guidelines issued by the US Preventive Services Task Force (USPSTF). This is a significant change from the previous position paper stating there should be no screening. The new guidelines recommend men aged 55 to 69 who are interested in screening talk with their physicians about the potential benefits and harms of screening for prostate cancer and then decide if they want to undergo periodic PSA-based screening. The USPSTF recommends against PSA-based screening for men aged 70 and older. 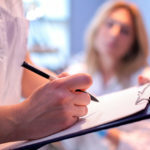 Oncology nurses may want to discuss these new guidelines with their patients because the update is such a significant change from the previous guidelines. The USPSTF makes recommendations on a periodic basis about the effectiveness of various preventive care services. These guidelines are an update from recommendations made in 2012. The authors of the report note that screening offers a small potential benefit of reduced risk of death from prostate cancer for a select group of men. However, potential harms such as a high rate of false-positive results could affect a significant number of men who undergo testing. The task force systematically reviewed evidence on PSA-based prostate cancer screening, treatments for localized prostate cancer, and prebiopsy risk calculators. The task force searched PubMed, EMBASE, Web of Science, and Cochrane Registries and Databases for studies published July 1, 2011, through July 15, 2017. The review included English-language reports of randomized clinical trials of screening and cohort studies reporting harms. The review also included randomized clinical trials and cohort studies of active localized cancer treatments vs conservative approaches, such as active surveillance. A total of 63 studies including 1,904,950 men were part of the review. The review found that randomization to PSA screening was not associated with reduced risk of prostate cancer mortality in either a large US trial or a large trial conducted in the United Kingdom. However, PSA screening was associated with significantly reduced prostate cancer mortality in one European trial with 162,243 men (relative risk, 0.79). “The new guideline moves the recommendation from ‘discourage use of the PSA test’ to ‘engage men age 55 to 69 years in shared decision for PSA testing.’ This is a major shift in the recommendation by the US Preventive Services Task Force for 2 reasons,” said H. Ballentine Carter, MD, professor of urology and oncology at the Johns Hopkins School of Medicine in Baltimore, Maryland. The first reason is that the benefits of PSA testing include a decrease in rates of metastatic prostate cancer and deaths from prostate cancer, which has become clearer with more recent studies, explained Dr Carter. The second reason is that the increased use of active surveillance for low grade prostate cancer, instead of immediate treatment, has decreased the harms of overtreatment.